Lambert Heller started TIB’s Open Science Lab in 2013. He led and supervised a number of succesful grant proposals with Deutsche Forschungsgemeinschaft (DFG), Federal Ministry of Education of Research, Federal Ministry of Health, and Leibniz Association. He frequently gives invited talks all over the world, often invited by Goethe Institute, ICSTI, NFAIS and other professional organizations. Lambert is @Lambo on Twitter: https://twitter.com/Lambo. skills development targeting professionals in research, libraries and research infrastructure, as well as early career researchers. On some of these topics, Lambert is extensively cited in OECD‘s biennial Science, Technology and Innovation Outlook(2016): https://doi.org/10.1787/sti_in_outlook-2016-en. 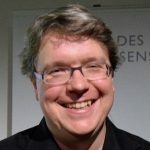 A recent podcast interview with Lambert (Open Science Radio, 90 minutes, in German) covers multiple areas of his work: http://www.openscienceradio.org/2018/12/10/osr133-lambert-heller-vom-open-science-lab-der-tib-de/. Lambert serves as a reviewer for Deutsche Forschungsgemeinschaft (DFG), German Online Research (GOR), and several peer-reviewed journals. Also, he is a proud advisor to projects like Open Knowledge Maps. Creating open spaces for communities & helping them to flourish: Lambert co-created the BibCamp event series (2008) and the Open Science Barcamp (2015). He consulted the Association of German Librarians (VDB e.V.) leading to the succesful “Hands-On Labs” (2017) and “Project Labs” (2018) session format within Bibliothekartag, the largest European librarian conference. From Book Sprints to X Sprints: Lambert initiated the book sprint leading to the award winning handbook “CoScience”, being cited by the German UNESCO Commission as a model for Open Educational Resources (OER) in higher education, and inspiring a number of other book sprints in Germany. In 2018, Lambert Heller and Helene Brinken facilitated the book sprint leading to the Open Science Training Handbook: http://book.fosteropenscience.eu/. Before starting the Open Science Lab: A social scientist by education, Lambert joined the academic library sector full-time in 2004. He fulfilled a Bibliotheksreferendariat (graduate trainee program in academic libraries) 2005-2007 at Freie Universität Berlin and Humboldt Universität Berlin. He joined TIB in 2008, serving five years as a subject specialist, and building up publishing related services for University of Hannover, including succesful DFG funding applications resulting in TIB’s initial Open Access publishing funds (2012).